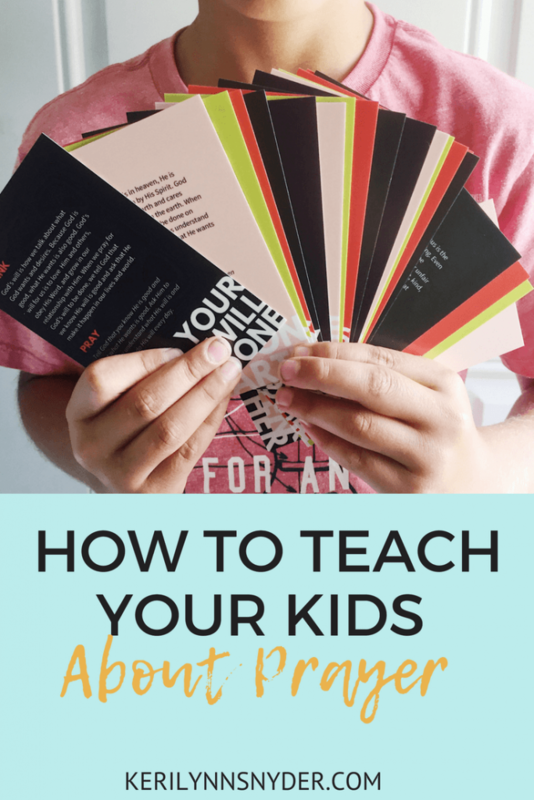 Looking to teach your kids about prayer but do not know where to start? These three tips will help you get started today! To teach your kids about prayer can be one of the most challenging aspects of faith and discipleship. With our focus on praying for our marriage and our school year, I have been thinking a lot about this topic. One truth that I have realized over and over is that prayer can happen in the everyday moments of life. Many times we over complicate and over think things. Instead of using the pockets of time we have, we still around waiting for the right moment, all while missing the right moment. Today, I am sharing four tips to help teach your kids about prayer in the every day moments of life. Whenever I talk to moms how how to teach your kids about prayer, I immediately think about our personal prayer lives. If we are not spending time in the Word and talking to God it is going to be hard to be able to teach our kids. As with all things, our kids are watching us. They follow our examples, often without even realizing it. It is our job to teach and train our kids. Our church family is a wonderful partner in this, but ultimately the learning happens within our own walls. Action Step: If you do not have a regular time with God, start one. Need help starting? Try using the Who I am reading plan. Remember, it is not going to be perfect. Sometimes we just have a few moments but those moments can be life changing. Guess what?! We do not have to do this alone! 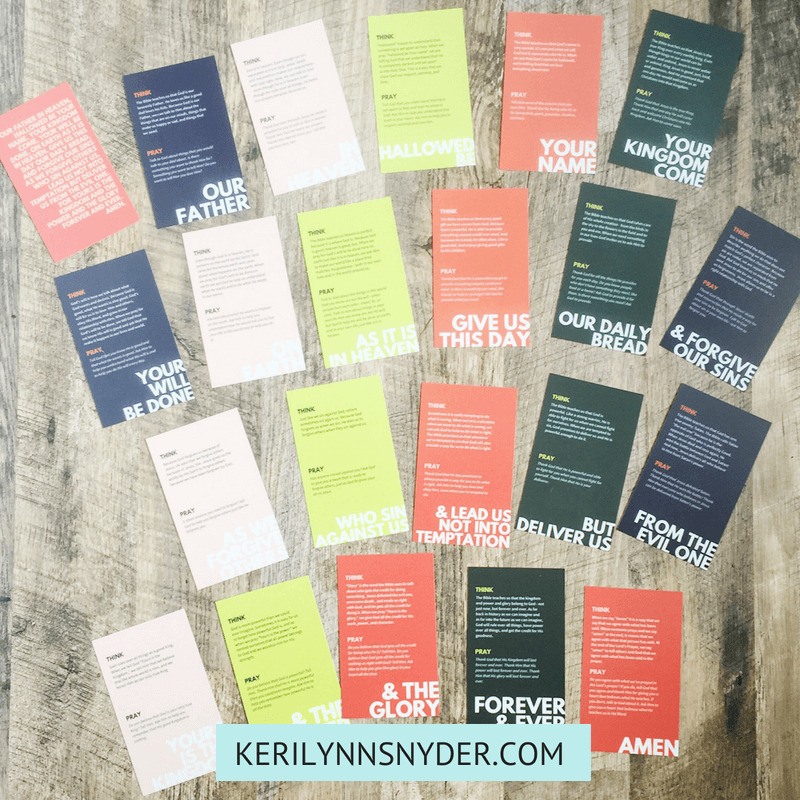 One of my favorite tools for teaching kids about prayer is from Tiny Theologians– The Lord’s Prayer Interactive Cards. 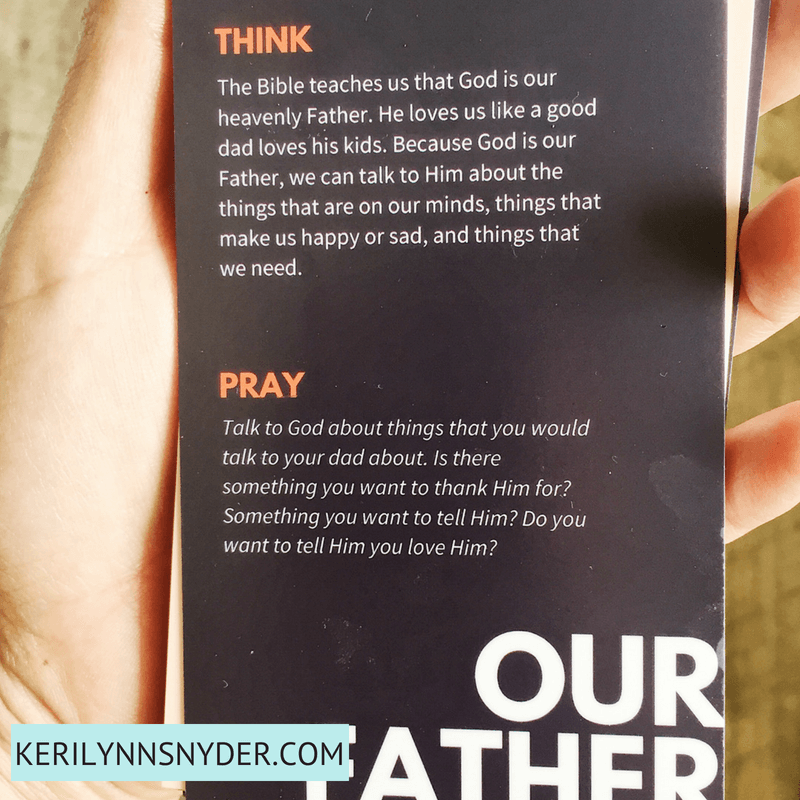 These cards go line by line through the Lord’s prayer and help your kids understand why we call God, “Our Father” and what “hallowed” means. Then there is a prayer prompt to help put what was learned into action. 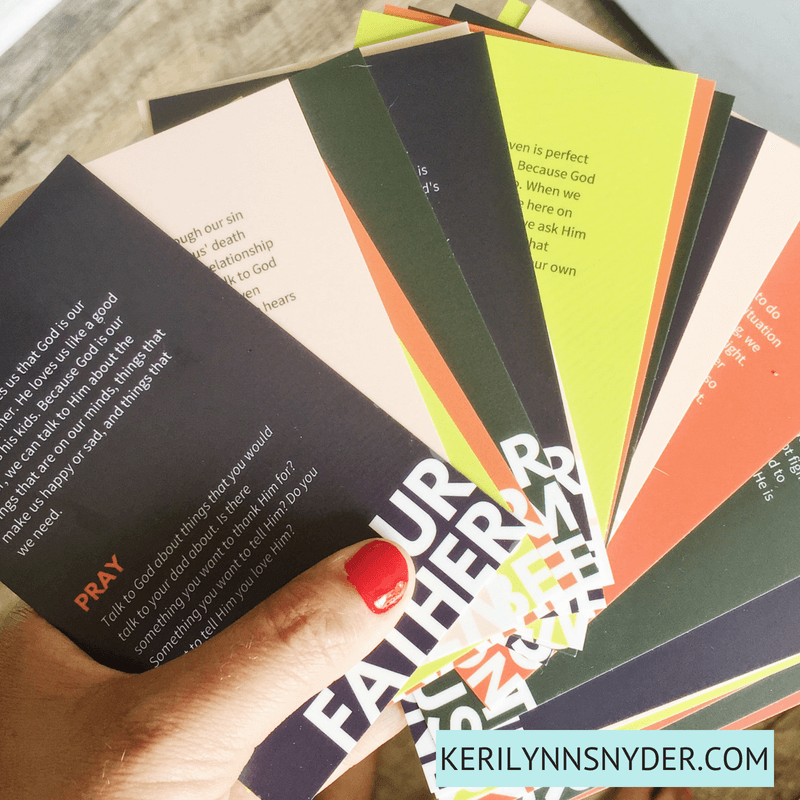 Tools like The Lord’s Prayer Cards are perfect to break out during dinner. They are easy to wipe off so you do not have to worry about the mess. It is a great way to have a “hands on” experience as you teach your kids about prayer. Action Step: Start using some hands on tools such as the resources from Tiny Theologians. Pray together on a regular basis. When we are doing something on a regular basis, it becomes a natural habit. In order to teach your kids about prayer, you need to be practicing it. Something that works well for us it so pray on our way to school, pray at meals, and pray before bedtime. There may be other instances of prayer but those are typically moments where we carve out time to pray every day. Action Step: Determine regular times to pray and then start putting it into action. Perhaps set an alarm in your phone at first to help. Sometimes kids can feel a little intimidated with praying because they think it has to be perfect. Recently, my husband was telling my son how he messed on on someone’s name during a prayer. We talked about how God does not expect perfection. The more we can ingrain into our kids that prayer is conversation, the more they will truly grasp this part of their relationship with God. Action Step: Remember grace and to let go of perfection! What about you? Do you have any helpful tips? Make sure to head over to Tiny Theologians to check out their great resources! We also have a giveaway on Instagram so make sure to head on over to enter! Loved this post?! You may enjoy reading about setting up regular family nights.